SANTA ROSA, Calif. -- The Sonoma County Community Development Commission released a homeless count report Friday that reflects the effects of the October 2017 wildfires. There was a 6 percent increase in the February 2018 homeless count compared to the 2017 count. Housing displacement in the wake of the fires clearly contributed to the increase of overall homelessness, especially in the city of Santa Rosa, according to the report. The percent of people experiencing homelessness for the first time increased from 24 to 35 percent, indicating that the October 2017 fires played a role in the homeless count increase. A telephone survey -- a companion to the homeless count -- showed 21,400 Sonoma County residents, or 4 percent of the county's population, were living in unstable housing situations. 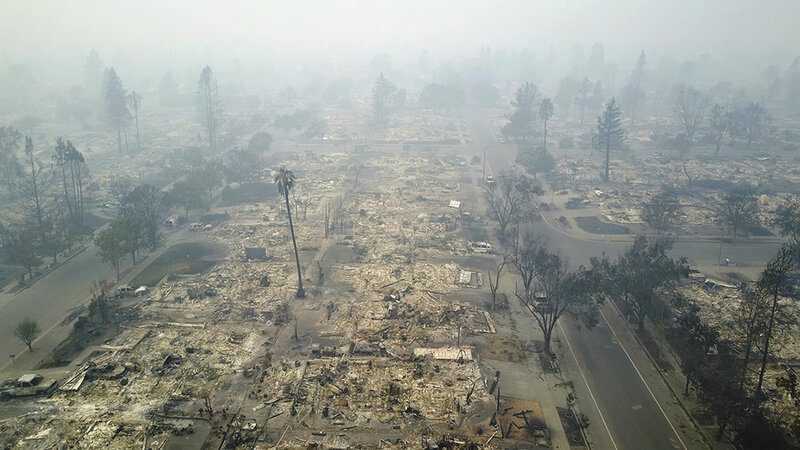 The survey by Applied Survey Research estimated that half of those people lost their housing as a direct result of the fires or due to the fires' economic impact. The phone survey also found that 43 percent of the people living in unstable conditions because of the fires were 55 years old and older. The Community Development Commission said Sonoma County has not yet fully experienced how the fires affect homelessness. The small 6 percent increase in homelessness between 2017 and 2018 is likely the first wave due to the fires, the Commission said. The first wave hit those with the fewest resources, and soon residents who are using up social and financial resources may also lose their housing. Those with limited resources, particularly seniors, are especially at risk of losing their house within two years, according to the commission. A 24-hour count on Feb. 23 found 2,996 people living in a place not intended for human habitation, in a shelter or in transitional housing for the homeless. The population in shelters or transitional housing for the homeless was 1,067. Thirty-six percent of the homeless were sheltered and 64 percent were living outside. The count found a slight decrease in the number of homeless veterans, from 211 to 207, a decrease in the number of homeless families with children from 111 to 104 and a decrease in the number of homeless youth from 532 to 515. The number of chronically homeless people rose from 598 to 747 and the number of homeless single adults rose from 2,393 to 2,623. The Community Development Commission will present its report to the Board of Supervisors Tuesday.